Wireless transmission of measurement and control signals are the future, and present, of process control. WiFi is already prevalent in higher density environments and providing benefits of reduced cabling and more. Wireless communications also can be used to connect devices over substantial distances, even globally. This article will focus on applications of moderate to long distance that will employ point to point communications of dedicated devices. In establishing a wireless process signal connection between two points, an initial consideration will be whether to employ 900 MHz or 2.4 GHz as the radio band. There are some general implications associated with the selection. Signal attenuation over any distance is greater for 2.4 GHz than 900 MHz. This generally means that 900 MHz can cover a greater distance and provide a signal of sufficient strength to properly communicate. Atmospheric attenuation for either frequency band is about the same, with a very slight advantage to 900 MHz. 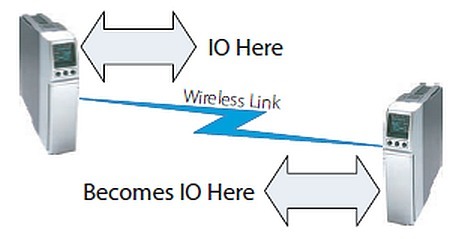 Both frequencies require "line-of-sight" to provide predictable and reliable operation. Obstructions within that zone can degrade the signal. Any obstructions with dimensions approximating the wavelength of the signal tend to have a greater impact. The wavelength of a 2.4 GHz signal is 12.5 cm (4.52 inches), 900 MHz is 33.3 cm (84.6 inches). 2.4 GHz signals are susceptible to interference by smaller objects in the transmission path than are 900 MHz signals. Without getting too technical, the height of a 900 MHz antenna will need more elevation than that of a 2.4 GHz antenna in order to provide what is known as "free space propagation". This is related to the Fresnel Zone and has greater impact as transmission distance increases. FCC rules allow larger transmit power ratings for 2.4 GHz radio signals than 900 MHz, increasing the potential range for 2.4 GHz. Having a general understanding of the factors that vary between 900 MHz and 2.4 GHz and how they might impact your installation can lead to a better project outcome. Evaluate your potential installations with the above points in mind. Their impact on any particular application can vary depending upon the distance, topography, and potential obstructions. Share your wireless communications challenges with application specialists. Combining your site and process knowledge with their product application expertise will produce an effective solution. Industrial Wireless Communications - Process Signals from Hile Controls of Alabama, Inc.